So have you heard about this one-pan pasta craze? 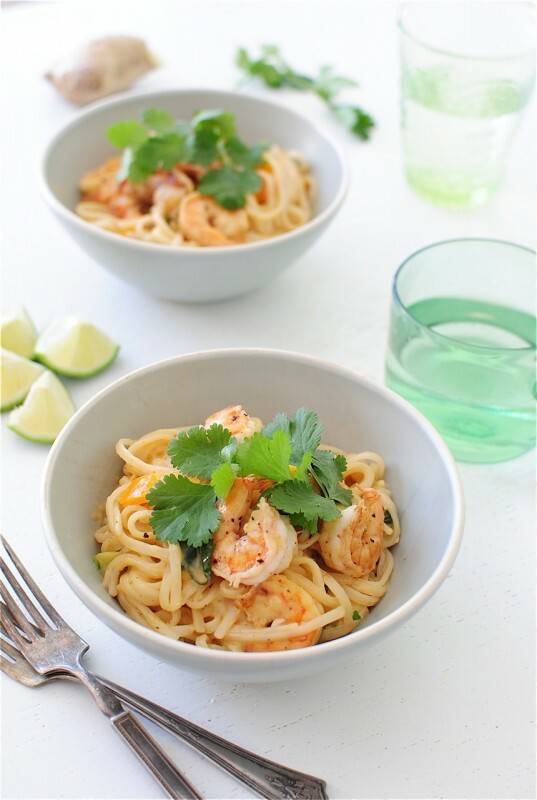 This one-pan pasta cray cray craze? WHY did I just do that. I’ve been doing so well. I first saw it on one of Martha’s 15 billion cooking shows. Then after that I started seeing it on 17 trillion blogs. Then after that I started seeing it in my sleep. Then after that I started seeing it in the clouds. Then after that I started seeing in the ceiling designs. Then after that I started seeing a therapist. So I made my own version. A Thai version. Kind of. Even though there’s no Thai curry paste in it. But you should add some! I had planned on adding some but then World War Three happened in one of my babies’ diapers, so I had to gear up and head to the front lines. I have yet to recover. Are you mad that I keep talking about dirty diapers above and below photos of silky noodles? Is this a deal breaker for us? It’s not like I’m describing what’s IN the diap – okay I’m getting the wrap-it-up red light from the back. One-pan. 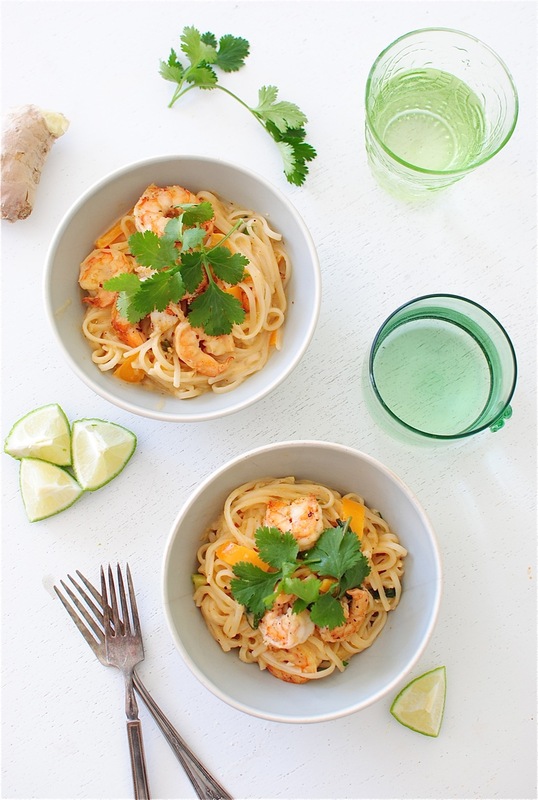 Creamy coconut noodles. 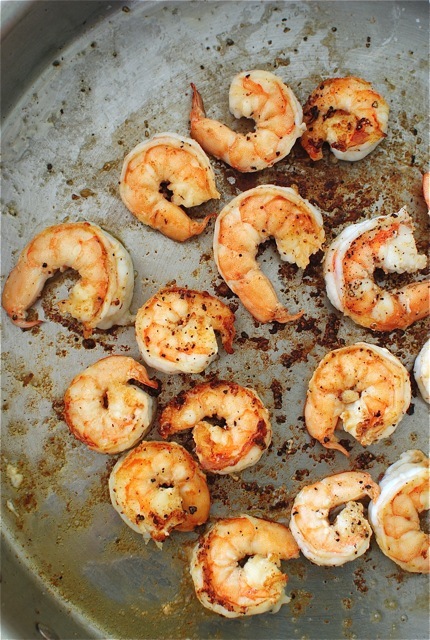 Seared shrimp. Your entire face. Heat the oils in a large straight-sided pan over medium-high. Add the shrimp, season with salt and pepper and sear on both sides until you get a nice sear, about 5 minutes total. Remove from pan and set aside. Back in the pan, add more oil if needed and toss in the garlic, ginger and bell pepper. 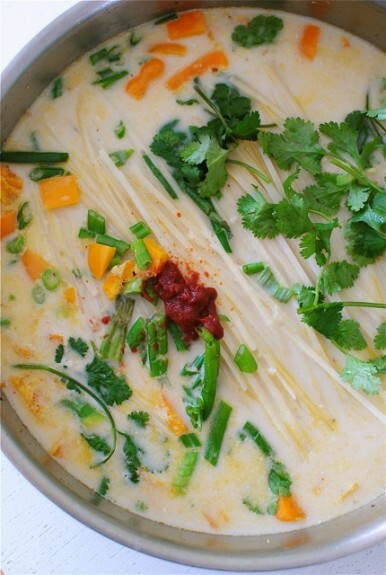 Sauté for one minute, then add the coconut milk, stock, noodles, fish sauce, sriracha sauce, cilantro and scallions. Bring to a boil, reduce heat and let simmer until noodles cook through, about 5 minutes. Take off the heat and add a few big squeezes of lime juice. Now taste that. UGH. Need anything? Add a little salt if you want. More lime juice? Yes. 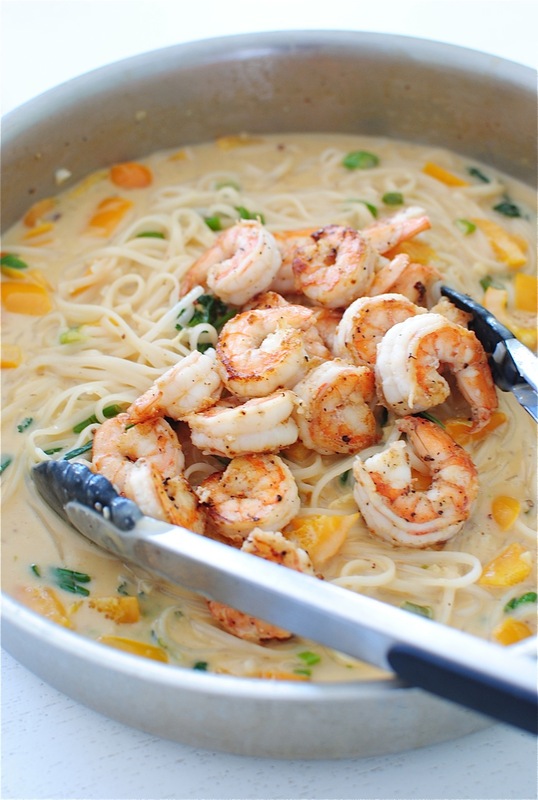 Stir the shrimp back in and toss to combine. Serve with more cilantro on top! Snow Day with Twins. And Wine. I can not believe I've never done this!!!!! I have everything on hand except coconut milk...I want to dive into this!!! one-pan ANYTHING is my kind of thing.... aka: lazy clean up is where this girrrls priorities are at! oh and thai pasta. I really love that this is thai pasta. Of all the umpteen billion versions I've seen of this dish, you made it the classiest. You rock! :) Need a babysitter? You had me at one pan! I have been pulling my hair out trying to simplify my favorite dishes so I can actually have time to eat after cooking [ahhhh babies!] and this is perfection! OK, I've been wanting to try this one pot craze, but haven't. Because I'm lazy, and maybe a little scared. Why? Don't know, but must try. Gorrggeous! Do you think it would work with light coconut milk? I'm currently doing Weight Watchers. It looks AMAZING! Thanks!! Light coconut milk would be JUST fine! You are so bloody funny ! I will be dreaming about this now until I make it ! I cannot wait to try this. I love Thai, one pot wonders, and cozy meals. that one spot pasta of Martha's haunts my dreams too Bev! I think the fact that you did this Asian version is sheer brilliance. Love everything about it and want it for lunch today. This. is. awesome. I've been seeing that pasta everywhere too. I used to give it the raised eyebrow, but now I'm starting to think it's totally legit. And I need to make it...like, now. This recipe looks super delicious. Can't wait to try it! I was thinking about it the other night: all of my meals have been "one pan" or "one pot" for SO long now that I don't even remember the last time we had separate dishes. Crazy. Literally. This may have to be my next conquered pan. Yum. This is all that I want. In life. Thank you. My Thai food binge is in over drive!!! This dish looks fantastic. You cannot beat a one pan dinner. Plus those flavors and shrimp. A winner for sure. Thai one pot!! Yes! This is genius and gorgeous! i'm totally making this for my family!! Bev. You are a mad scientist genius. First you create beautiful angel baby twins, and now this. I made it immediately as I am currently OBSESSED with Thai flavors. I threw in some cubed sweet potato chunks because that's my other weakness. Also, I'm glad your sweetie babies haven't stolen your quirk. You're going to be the most fun mom ev.ar. WAIT. I thought the term "one-pan" meant: one person should eat the whole pan by herself. I reluctantly stand corrected. oh. em. gee. this turned out AWESOME!!!! i used thai ginger broth (new from swanson!) and added extra sriracha (cause its sriracha) and i omitted the yellow pepper because i didnt have any. this could be one of the best recipes ive ever made, and it was so simple. thank you for sharing, i will be making this regularly!! This was so incredibly delicious! Thanks for the great recipe. No, food and diaper talk don't fit. Sorry. Yum, this looks soooo good! I am seriously craving a giant bowl of noodles right now. For breakfast. Is that bad? I can't wait to try this dish, simple enough and I know the husband will chow down on it! I just made this for dinner. Good gracious, it was delicious! We all loved it. This is one of my favorite recipes of all time. could you do this with rice noodles? Oh absolutely! Rice noodles are what I used. Thai rice noodles. I'll update my recipe to be more clear! Oh. My. Goshhhhh. This is amazing. So many flavors and depths. Made this last night and I'm still dreaming about it. You're too smart for your britches. Two things: I want this pasta and I love the peek into life with twins. You make it seem pretty darn fun(ny). Yow - that was mighty tasty. Think we may try it with chicken too! Muchas gracias por escribirnos post como este! Stumbled across this on Pinterest, and fell in love! This is soooooooo good! I've already made it twice, and I'm definitely coming back for more! 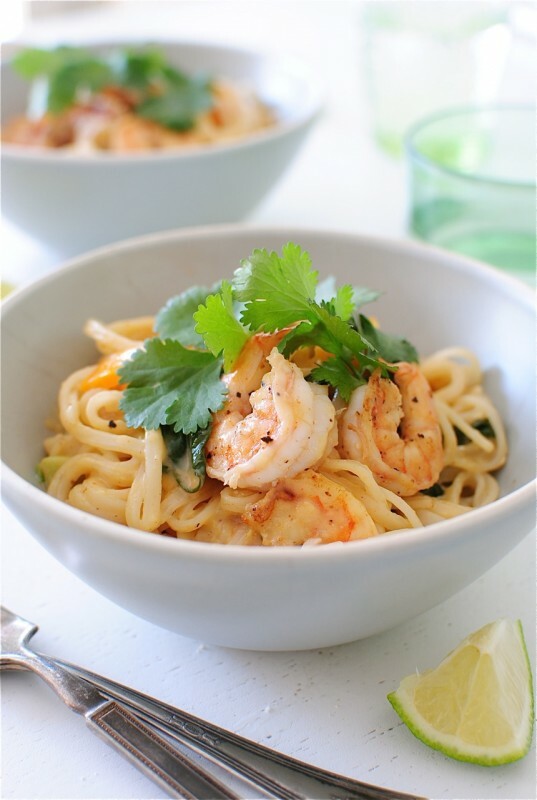 I think coconut & lime is my new flavor combo, and this dish is so light and flavorful; yet filling & satisfying! This one's a keeper!!! Recipe, yum. Diaper talk, blech. I wish I could unread that. Ick, ick, ick. So yummy and flavorful! Followed per the recipe except I used sugar snap peas instead of bell pepper and tamari sauce instead of fish sauce. Will definitely be making this again. Thanks for the recipe! Hi, once i'm ready to remove from heat, should there be no liquid left or do i have to drain the noodles? No draining! There should be a little sauce in it, but the noodles will have soaked up most of the goodness. Let me know how it works! thanks! i tried this over the weekend and it was AMAZING!!!! super easy and super tasty! thanks for sharing! i just used this recipe. my computer is literally on the kitchen counter. SO DELICIOUS! Like others who posted before me, this was amazing! Easy, simple, delish! Make it! 5 stars! This was so good! I've been waiting for a good recipe to use for my can of coconut milk and this was if! Only changes I made to this were a little less shrimp since it was only for two people (3/4 Lb ), less chicken stock (1 cup) , I didn't have a bell pepper so used a small purple hot pepper, and more pasta ( added some nests of regular carrot pasta in with the pad Thai pasta). And I still have some leftovers for a lunch! FYI, some old Siracha sauce made this really spicy! i love your writing style! And the recipe sounds yummy too! I will have to make it soon! Thanks so much for sharing! So made this tonight, comments, grill or sauté the shrimp but do not add to the sauce, shrimp only need a short cook and when over done they get tough, so cook them about 90 seconds a side and add them at the end.. had enough sauce for two meals, which was good because the sauce was good and will do another meal. Yes i know it is not purely a one pot mean, but the end product it the point. did add some red curry paste. I am a new cook and have not been able to conquer a single meal yet. After a few weeks on my Pinterest board, I tried this recipe tonight...it wasn't terrible! This is a major feat for me. Thanks for this delicious recipe. Made my night.